joy magnetism: To the brotherhood! 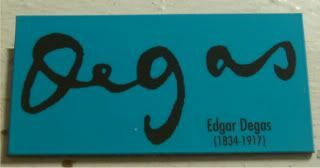 This Degas signature is the first in a set of about 33 artists signature magnets. I know. Wait til you see tomorrow's 63 magnets set. Anyway, I picked this for today because I finally finished watching the BBC's Desperate Romantics, all about the Pre-Raphaelite Brotherhood of Millais, Hunt and Rossetti, and a few others, artists who banded together back in 1840s England. I could bore you with all the details of what they painted, and what they stood for, but that would defeat the purpose of watching this six-part miniseries. The six-part miniseries that I thought DCSis had watched and liked, and therefore I felt like I had to sit through all six hours. Only to find out she barely made it through the first episode. Sigh. By the time I realized I didn't want to watch the rest of it...I was about five hours in. Goodness. I definitely had to watch it, because I thought it'd be like the other BBC miniseries, The Impressionists, explaining the stories behind their famous works of art. Instead, I got Entourage, for artists...which is how they billed it. I don't mind Entourage at all, but honestly, I couldn't get into the backstabiness of these artists - true or not. The best part of the movie was the one painting backstory that I really loved, that of Millais' Ophelia. In a magnificently cast role, the woman who posed for Ophelia, basically their Yoko (or Sloan) inadvertently causing strife between the boys, was superb and eerily a carbon copy for the real painting. If the series is to be believed, then while she was posing in a cold bathtub of water, she nearly drowned because of hypothermia and passing out in the water. Crazy. The saddest part of the movie? Is watching how hard (or not hard) this band of brothers worked to make themselves known to the art world. And in the end? Not a one was included in my magnet set of 35 artists. Sorry! I never said I *finished* the whole thing!